The collection of patents of Adolphe Kégresse shows an interesting story of development of ideas and designs. The noted residence for the first patent is Russia and clearly shows the first rebuild made on luxury cars from the garage of the Zar. Already in 1914 the design of the belts used in the black expedition is evident. As the first cars are built and tested, the patents covers suspension, bearing design, adjustment of belts and adjustment after wear of wheels and belts. 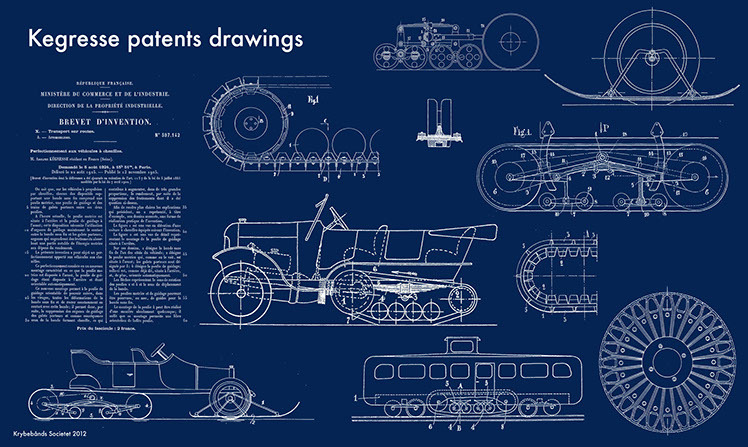 In 1920 the first special designs for snow turns up. There are also several inventions never used in production cars. Perhaps these were patented to block potential competitors. In 1921 a radiator for hot climate is patented, just as the black expedition started. Up through the 20’ties the patents cover belts and suspension leading to the designs used on the last Kégresse cars. Among the last patens are some interesting designs using both rear wheels and belts. The complete ammount of documents is over 300 patents, you can download the overview list, or all the patents as a zip file. Klick HERE for the complete list of Kégresse propulsions patents!